The city’s longest running professional sports team is back for its 27th season. 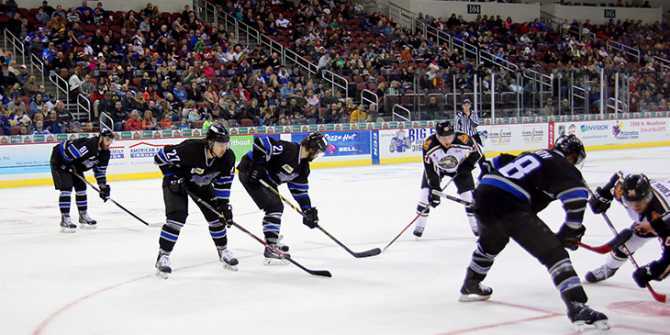 The Wichita Thunder kicks off the 2018-19 hockey season by hosting the Idaho Steelheads, the NHL’s Dallas Stars affiliate, on Oct. 12 followed by the Allen Americans, the Minnesota Wild affiliate, on Oct. 13. Wichita joined the ECHL in 2014 after spending 22 seasons in the Central Hockey League. This season is the team’s third with an National Hockey League affiliation, the second year as the Edmonton Oilers’ third-tier farm team below the AHL’s Bakersfield Condors. Under the affiliation agreement, the Oilers are able to designate players within their development system for assignment with the Thunder. Coach Malcolm Cameron enters his third year in Wichita after leading the Thunder to its first-ever playoff appearance since joining the ECHL. The team had a franchise-high 34 ECHL wins with 21 of those coming at home. The Thunder finished 34-30-6-2 last season and advanced to the playoffs for the first time since joining the league. Ralph Cuddemi, the leading scorer and MVP from last season, returns this season. The 25-year-old finished tied for fifth in the ECHL for goals (33) and 13th overall in points (64). Last year’s team captain, Dyson Stevenson, also returns. The 24-year-old won two ECHL titles with the Allen Americans before joining the Thunder before last season. He had a career season, notching 30 points (14 goal, 16 assists) to go along with a team-leading 188 penalty minutes. Another player to watch is newcomer Matt Schmalz, a 6-foot-6, 218-pound forward. The Thunder’s regular season runs mid-October through early April, with 36 games this season on home ice at downtown’s INTRUST Bank Arena. The team recently announced what it calls the best promotional schedule in franchise history. A look at the Wichita Thunder hockey schedule shows popular returning events like Pirates and Princesses Night, #ILOVEWICHITA Night and Nickelodeon nights featuring SpongeBob SquarePants and the Teenage Mutant Ninja Turtles. There also are new events on the calendar, like a Fred VanVleet bobblehead giveaway, Wizards Night and Dinosaur Night. Click hereto see the full promotional schedule. A family of four can enjoy Wichita hockey for about the same cost as going to a movie.Individual Thunder tickets range from $9 to $40, with discounts for youth, seniors and military. There are also season tickets and mini packages available. Thunder game nights include food and beverage options throughout the arena, a Thunder merchandise store, entertainment, activities and contests on the video screen or on the ice throughout the game. Click here to learn more about the team and for a link to buy Wichita Thunder hockey tickets.